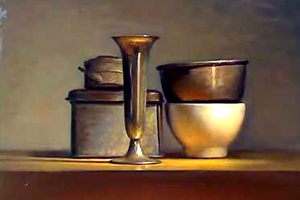 Realistic still life painting demo by dutch artist Jos van Riswick. Using artificial light in this setup. The objects are lighted from above by a spot light, which creates a strong reflection on the table top. I used a slow medium of approximately 6 parts linseed oil and 1 part Graham Walnut Alkyd, allowing me to paint wet into wet for 3 days. (3d day only final touches.) In this one I made extensive use of the ruler to move the brush along, because there are several straight lines (sides and edges of the box, and the thin lines of shadow on the table top). Somewhere halfway the video, you might notice the colors getting cooler. I made the light on my easel slightly cooler, because I found the colors in the painting becoming too cool when viewed in day light. Portrait Photography Business Tips - Where Do I Start In My Photography Business?